Is Cash Out Worth It? Tennis Retirement Rules – How do they impact your bets? Today we met Alex who has been matched betting for 2 years and told us that he made £31,000 in just 12 months whilst using Profit Squad. An incredible profit! Below, we get to ask Alex about how was able to achieve such results and if he has any advice for new members. My names Alex, I currently work at a pharmaceutical company in Compliance and I live in the South East. How long have you been matched betting? I’ve been matched betting around 2 years now although it feels a lot longer, and it all started with Profit Squad. 26th May 2016 was the date I had my first email from yourselves – it was titled “Getting Started with Profit Squad”. So I guess it’s safe to say that was my starting date. What originally made you join ProfitSquad and how did you hear about us? Well, I’ll give you a bit of background behind why I came across matched betting in the first place. I remember my friend telling me one summer, which must have been 2015, about someone telling him that he knew a way to guarantee money from online roulette. After playing roulette a fair amount, my reaction was a reasonable ‘oh of course he does…’, but I still was interested in hearing about it. He said it was something along the lines of ‘covering all the options’ (which I later found out was obviously about back/lay betting). Fast forward to 2016 where I needed a bit of extra cash and I vaguely remember the conversation, so I decided to have a Google and that’s where I found out about matched betting. Now I can’t remember if it was actually Profit Squad that I found first, but it was the one I chose. I watched the video on your home page and was hooked straight away. Also the deal you had going on which was £1 for 14 days (if I can remember correctly) was also something that enticed me to sign up. How has your experience been so far? To sum it up in one word? Unreal. I’ve had my fair share of ups and downs, and my fair share of silly mistakes but I’m human and its part of the process. To simply put it, it has changed my life. Now I can’t say for sure that if I was to of joined another service that it would be any better/worse because I simply wouldn’t know, but what I do know is that your service has provided everything I’ve ever needed. From beginners training and ongoing help/advice, to providing offers/loopholes, and to having a great community. 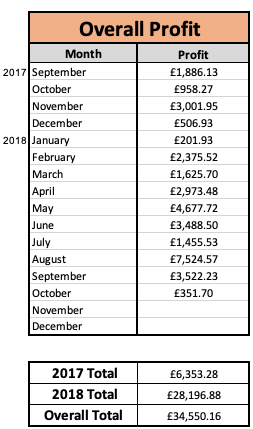 I was over the moon with my profits last year and that wouldn’t have been possible without Profit Squad. How much profit do you make roughly each month from matched betting? Around 1-3k on average (See below). Do you know what your total matched betting profits are? I did say I started in May 2016, however, I didn’t really keep track of profits between May 2016-August 2017 as I spent it as soon as it came. But from the 12 months where I started reinvesting my profits and recording them, I made 31k. On top of a decent paying job (or any paying job to be honest), that’s something that you really cannot complain about. Just a few things to note – 1) I was away for half of December on holiday and I used 80% of my matched betting bank on that holiday, so that month and January was a bit on the slow side. 2) I stopped 1/3 of the way into October as I started a new job and I wanted to take some time out to enjoy my winnings etc. What do you spend your matched betting profits on? I went on a total of 5 holidays between September 2017 and November 2018, including a 2 week trip to NYC over Christmas and New Year (not on the cheap side). I went full time matched betting from June to October, which was funded by matched betting. I paid for my flat deposit and furniture, paid off debts, only buy the expensive toilet roll etc. Overall it funded an amazing 2018, where money was not an issue at any one point, which is hard to say for quite a few people. How much time per week do you spend matched betting and how do you fit it into your current lifestyle with work/family etc? It really depends – now that I’m working 9-5 Mon-Fri, I usually get in about 2 hours on weeknights. Can be more and can be less. Back in the beginning, I was spending more time obviously as I was new to it and sometimes had little idea to what I was doing, but now it’s become second nature and I can do it in a 1/10th of the time. I did mention I was fulltime matched betting at one point, and then I would start at whatever time I felt like getting up and finish at whatever time I felt like it. But obviously, it wasn’t non-stop 8 hours matched betting, I would take my time doing offers and do a lot of other things on the side. What are the main offers which you focus on, on a weekly basis or when they’re available? In my 12 month period above, I was doing 80% low-risk casino offers, 20% ACOs. I don’t think I touched a sports offer unless it was Cheltenham or the B365 Bet 50 get 50 free bet offers. I felt like 2018 was the time where casino offers shined, and that’s where I focused all of my time on. In 2019 things are a little different, I have to build up my bank again. So I’m doing a lot of sports offers and low-risk casino offers. I’ve dabbled in a few ACOs too. In terms of 2up/high 5 etc, I think I’ve done it 5 or 6 times maybe. I’ve also dutched a couple of races in my time too. Roughly how much of your time is spent between casino and sports offers? Roughly, what percentage of your profit is generated between casino and sports offers? Kind of a similar answer as the last two, near enough all of my profits have come from casino offers. When I first started, it was obviously all the signup offers. But I spent all of that profit as soon as I got it – when I started properly recording my profit, the main bulk of the offers I was doing were casino offers and that’s where I got most of my profit. How has ProfitSquad helped you in your matched betting journey? In so many ways. From the easy to understand training that was provided when I first signed up, to the ongoing support I’ve had through my time here. I even remember the old Facebook group that there was. The way that you pretty much do everything for us (obviously apart from place bets and spin on slots…) finding offers, providing support etc it’s been really really helpfully and I don’t think I would have changed anything. What do you like most about ProfitSquad? When I first started, it was the training and friendliness of the staff. That is/has been second to none in my opinion. As I’ve progressed and relied a lot less on that part of Profit Squad, for me it’s now the community and discord. You provided a brilliant platform from beginner to expert (If I can call myself one of those..). Just want to note that I’m not saying the training and friendliness of the staff has changed, it’s just that I don’t rely on that as much as I used too so my favourite part of PS has progressed onto something else. What tips would you give to someone who is considering starting matched betting? 1) Trust the system, it really works. I was sceptical at first, as you should be. But there are 100s if not 1000s of members here who was in your position and now look where they are (me for example). 2) Reinvest your profits. Don’t get me wrong it’s amazing when you make your first £10, £100 or £1000, but if you really want to make your second £10, £100 or £1000, put it back in your matched betting bank and get doing more offers, it makes it SO much easier. Build up my matched betting bank again to 5 figures. I don’t see it being a hard or challenging goal, and from past experiences, it could be right around the corner. But I want a simple goal for this year. Anything else you’d like to add that you think may be beneficial to readers? Just keep at it, there will be hard times etc. But have a little moan about it (seems to work all the time) and you’ll turn it around. Copyright © Profit Squad 2019. All Rights Reserved. | Void where prohibited. Applicable to users over the age of 18 only.